Note from Beth: In 2014, digital marketers predicted the rise of “niche social networks,” as it becomes increasingly harder to reach your audiences on general social networks like Facebook, these highly targeted online social networks are going to become more valuable. My Ocean, is a niche social network of more than 9000 divers and this guest post by Darren Barefoot describes some powerful outcomes for ocean conservation by bringing together several strategies: niche social network, crowdsourced data mapping, and deep engagement. 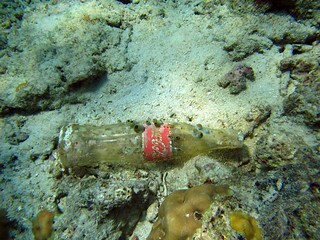 New information collected by citizen scientists provides an underwater view into the growing problem of ocean trash. An interactive map launched by the non-profit Project AWARE visualizes nearly three years of ongoing reporting by a network of scuba divers who remove marine debris from the world’s ocean. The map is a digital showcase of the real-world work its volunteers are doing to protect oceans. For decades, scuba divers have been cleaning waterways. Project AWARE has always hosted beach and ocean cleanup events around the world. But they knew that in order to scale their work globally, they needed to use the web to influence lasting change. So in 2011, the organization adopted an online movement-building model that they hoped would more effectively engage its community of half-a-million divers. Their movement-building approach was focused around a new web platform and programs. By launching My Ocean, an online community of more than 9000 divers, they shifted a lot of offline activities onto their website: dive leaders, volunteers and advocates could connect; find dive events and activities taking place nearby; promote their own events; talk about local issues and ideas and celebrate one another’s successes. Although 9000 divers isn’t exactly Facebook-scale, they represent many of Project AWARE’s most highly-engaged members–dive shop owners, trainers and advocates who are near the top of the organization’s engagement ladder. Also launched in 2011, the Dive Against Debris program asks dive shop operators and individual divers to become citizen scientists. Now, when divers return to land, they report the quantity, type and location of debris found using a form on Project AWARE’s website. With the help of identification guides, data collection cards and safety guides—available in six languages—thousands of divers have been trained how to report their findings to the organization. Today, almost 400,000 pieces of trash from over 1000 dives appear on the interactive Dive Against Debris map. Divers can view their work on the map and see how it combines with other reports to reveal a growing picture of marine debris. Map users can zoom and click through to individual reports from around the world, and filter by different debris types and time periods. They can also see photos from underwater reports, which make it easier to understand the impact that everyday trash is having on fragile marine life. Project AWARE hopes that the map will recognize the efforts of the thousands of divers who contributed to the data set, and shine a light how our everyday trash ends up in the ocean. It’s the latest in a series of efforts to more tightly connect offline activities—whether they be advocacy actions above the water or trash clean-ups underwater—to the online world. Since embracing an online movement-building approach in 2011, Project AWARE’s community has tripled its support base to 1.5 million divers. With the help of online tools, like the interactive map, they hope to step up participation in Dive Against Debris. Ultimately they want to help identify target areas where waste reduction efforts are needed most. What examples of niche social networks, crowdsourced mapping data, and engagement to solve a social change issue have you seen?